Melbourne Physiotherapy Group is pleased to offer our clients access to Extracorporeal Shockwave Therapy (ESWT) as a part of our suite of services. 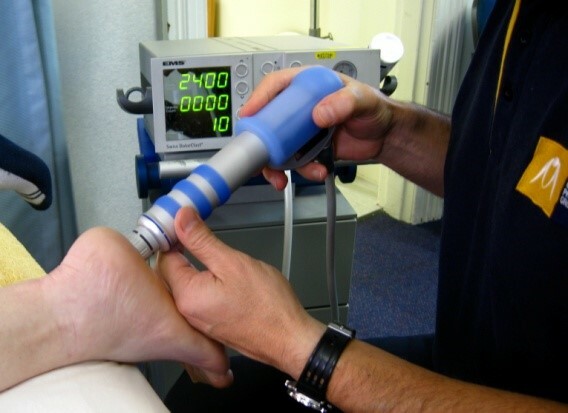 ESWT, also known as Shockwave Therapy, or Radial Shockwave Therapy, provides treatments to patients suffering from a range of chronic conditions such as Plantar Fasciitis and Achilles Tendinopathy that are notoriously difficult to resolve. Shockwave treatment was originally developed to treat kidney stones (renal calculi) and is known as Lithotripsy treatment in this area of medicine. It was developed to provide an alternative to surgery in these patients. Some patients who had their kidney stones successfully treated also reported improvement in chronic musculoskeletal conditions in regions which were in the pathway of the shockwave treatment. The basic principles behind shockwave therapy are the high pressured acoustic shockwaves that travel through the skin to stimulate pain relief and tissue repair. What conditions does Shockwave Therapy treat? Impressive results have been reported in cases that have been recalcitrant and failed to respond to treatment regimes including conventional approaches. What sets this treatment apart from traditional treatments is that it treats the musculoskeletal pathology instead of just offering symptomatic relief. The physiotherapist will pass the shockwave applicator over the injured area. While the stimulation may produce some discomfort, patients often feel immediate reduction of pain in the first 24 hours after treatment. The therapy usually takes up to 5 sessions of 10 – 15minutes.